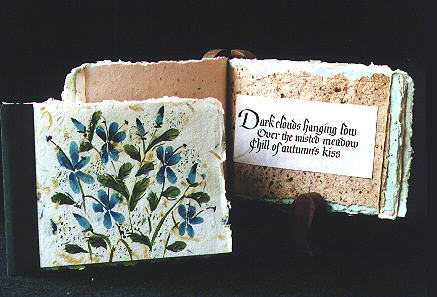 Each page of this book is of the artist's handmade paper, which was formed using junk mail with organic inclusions from yard and gardens. The haiku poems composed during back country excursions) were written out in mostly Italic variations, then photocopied.They are verbal expressions as vivid to the artist as photos. The cover has handpainted flowers also by the artist.